Last week I wrote about Matlab’s built-in pause function, that not only leaks memory but also appears to be less accurate than the equivalent Java function. Today I write about a very similar case. Apparently, using Matlab’s delete function not only leaks memory but is also slower than the equivalent Java function. The memory leak in delete was (to the best of my knowledge) originally reported in the CSSM newsgroup and on this blog a few weeks ago. The reporter mentioned that after deleting 760K files using delete, he got a Java Heap Space out-of-memory error. The reported solution was to use the Java equivalent, java.io.File(filename).delete(), which does not leak anything. I was able to recreate the report on my WinXP R2012a system, and discovered what appears to be a memory leak of ~150 bytes per file. This appears to be a very small number, but multiply by 760K (=111MB) and you can understand the problem. Of course, you can always increase the size of the Java heap used by Matlab (here’s how), but this should only be used as a last resort and certainly not when the solution is so simple. I placed it in a function to remove command-prompt-generated fluctuations, but it must still be run several times to smooth the data. The main reason for the changes across runs is the fact that the Java heap is constantly growing and shrinking in a seesaw manner, and explicitly calling the garbage collector as I have done does not guarantee that it actually gets performed immediately or fully. By running a large-enough loop, and rerunning the test several times, the results become consistent due to the law of large numbers. Running the test above with the delete line commented and the java.io.File line uncommented, shows no discernible memory leak. To monitor Matlab’s Java heap space size in runtime, see my article from several months ago, or use Elmar Tarajan’s memory-monitor utility from the File Exchange. Note: there are numerous online resources about Java’s garbage collector. Here’s one interesting article that I have recently come across. When running the test function using java.io.File, we notice a significant speedup compared to running using delete. The reason is that (at least on my system, YMMV) delete takes 1.5-2 milliseconds to run while java.io.File only takes 0.4-0.5 ms. Again, this doesn’t seem like much, but multiply by thousands of files and it starts to be appreciable. For our 50K test harness, the difference translates into ~50 seconds, or 40% of the overall time. Since we’re dealing with file I/O, it is important to run the testing multiple times and within a function (not the Matlab Command Prompt), to get rid of spurious measurement artifacts. 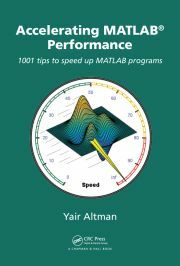 Have you encountered any other Matlab function, where the equivalent in Java is better? If so, please add a comment below. In text you explain “*pause* takes 1.5-2 milliseconds to run while java.io.File only takes 0.4-0.5 ms”. Do you really mean *pause* or *delete*? works like a charm… AS LONG AS you don’t have the need to search the entire Matlab path. That is the ONE thing the Java call won’t do that the exist() call does. Do we know if this memory leak still exists in Matlab 2013b or newer versions? @Bobby – the test script above should be fairly easy for you to run on your specific system to check this. And as noted, you can always use the java.io.File(tn).delete() workaround. i ve got a problem with saving matlab files (.mat). yesterday I overwrote my existing file. no errors occured. today, my file is almost empty (one of 4 folders left). is there ANY possibility to recover/restore? @Stefan – MAT files do not contain history (except if you designed them to contain it), so yyour only option is to check if this file was backed up. Arash Marashian (13 days 17 hours ago): Problem Solved. I found out that my version does not have this icon. thanks. Marshall (14 days 20 hours ago): This was a fun puzzle–don’t hesitate to add more posts like these if you come across some other fun ones! Reza (15 days 3 hours ago): I have the same problem. this Java widget got error in compiling via Matlab 2018! Could you please show me how to solve this? GGa (16 days 21 hours ago): There isn’t anything “outside the UTF-8 range”. UTF-8 can represent any Unicode character, as far as I know.